As automakers turn their vehicles into app-laden computers on wheels, there’s one habit they don’t want to acquire from Silicon Valley: fighting over patents in court. Manufacturers from BMW AG to Hyundai Motor Co. to Ford Motor Co. are trying to learn from the smartphone wars, which cost technology companies hundreds of millions of dollars in legal fees, as they prepare to revolutionize their vehicles. “No sane automaker wants to repeat these wars, where the lawyers were the only winners,” said William Coughlin, CEO of Ford Global Technologies, Ford’s intellectual property arm. Automakers have ramped up their patent applications as they compete to roll out crash avoidance systems, on-board Wi-Fi and cars that can drive themselves. To avoid court battles over who gets paid and how much, competitors are banding together to jointly license technology, use non-proprietary software and buying or challenging patents that might be used in lawsuits against them. 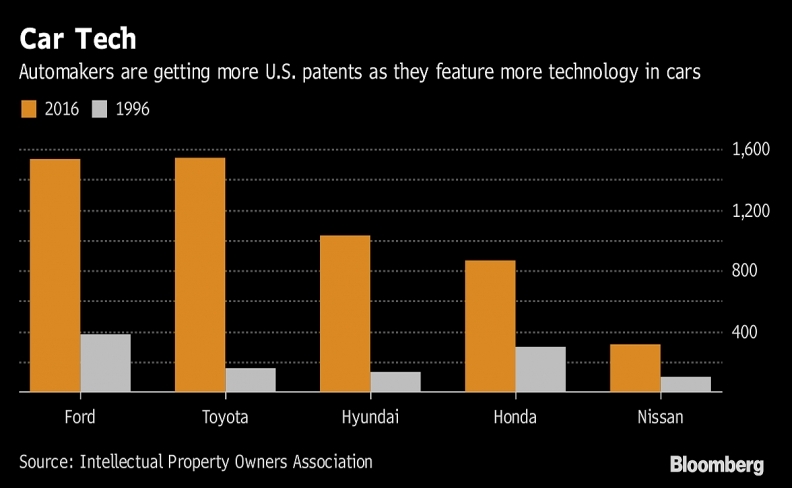 Both Toyota and Ford were among the top 21 recipients of U.S. patents last year, with 1,540 and 1,530, putting them in company with Apple Inc., Qualcomm Inc., and Alphabet Inc.’s Google, according to figures compiled by the Intellectual Property Owners Association. Toyota’s recent patents cover ways to keep a vehicle in the proper lane and respond correctly at a traffic signal; Ford won rights to sensors that gather data from other vehicles and a system to measure customer satisfaction by expressions or statements made while driving. The smartphone wars that began in 2010 were sparked by a clash of the phone and computer industries and pitted iPhone-maker Apple against manufacturers of phones that ran on Android, the operating system owned by Google. Microsoft Corp. also got swept in when it demanded royalties on phones that used Android. Technology companies frequently resolve patent disputes -- others have been over computer memory, networking and video cards -- in court. But the big automakers tend to settle their fights more informally or let suppliers duke it out. Ford, Honda Motor Co., Hyundai, Tesla Inc. and Volkswagen AG are members of the LOT Network, a non-profit consortium in which companies pledge to continue to make their patents available to all members even if they sell them to another firm. Daimler AG, Ford, and Toyota are among those belonging to Unified Patents, which challenges patents at the U.S. Patent and Trademark Office. Ford also is a member of RPX Corp., a risk management service that buys up patents and challenges patents that already have been issued. Last week, BMW became the latest automaker to enter a licensing deal, agreeing to pay a per-car fee to gain access to a “pool” of patents related to wireless industry standards from companies including Qualcomm, Ericsson AB, Sony Corp. and eight others. “They see every day there is litigation and they don’t want that,” said Kasim Alfalahi, head of Avanci LLC, a Dallas-based group that operates the patent pool. “They say, 'We have looked at this, we have studied this and we would like to avoid it.'" Figuring out the proper royalty rates for use of industry standard technology has led to global fights among technology companies, the most prominent being Apple and Qualcomm’s three-continent combat over what patent fees Qualcomm collects from each iPhone. Automakers “look at the fights right now, and they understand that a lot of it has to deal with the pricing and expectations,” said Alfalahi, who was Ericsson’s top intellectual property counsel before starting Avanci. Another way carmakers are cutting costs is by using non-patented technology. Open Invention Network, which buys and cross licenses patents related to the open source Linux operating system, has signed up companies such as General Motors and Daimler, giving them free access so they can then build their own individual applications for on-board systems to monitor traffic patterns, help cars avoid crashes or perform other functions akin to a computer or smartphone. The automotive industry hasn’t been completely immune to litigation. When it comes to self-driving vehicles, it’s still somewhat of a “Wild West,” with companies all over the country doing research and hoping to come up with the next big thing. That’s already spawned a nasty fight, with Alphabet’s Waymo claiming Uber Technologies Inc. stole trade secrets for the laser-based sensors known as Lidar. A big chunk of the lawsuits against tech companies were an outgrowth of the dot-com bust, during which sharks picked up patents from bankrupt internet companies and then demanded royalties from companies that were still in business. Companies such as Delphi Automotive have expressed concern that the same thing may happen to companies that don’t succeed in the autonomous car market, said Bruce Rubinger, founder of Global Prior Art, which conducts research on the validity of patents. The automakers and suppliers have been investing in technology companies, so they will own rights to some of the research no matter what happens with the company, Rubinger said. The relatively slow pace of change in the auto industry can help it avoid some legal problems. In the technology industry, new products are introduced every 18 months, but it can take four years or more for a new automotive feature to go from the design stage to the showroom floor. And the auto industry will be able to draw on the legacy of the technology industry’s patent cases. Court rulings make it easier to invalidate patents and lower the amount of damages that can be awarded. Legislation also created a new procedure at the U.S. patent office that’s been embraced by Silicon Valley for its reputation as a “death squad” for patents.